Are you looking for a Seniors strength class Keperra? At North West Physiotherapy our strength and balance classes are supervised by a qualified Physiotherapist and tailored to your individual needs to help achieve your fitness and lifestyle goals. Our exercise classes are perfect for people aged over 50. Whether you want to maintain your health and mobility into your later years, or for those requiring rehab following injury or surgery. Phone 3198 4444 or visit our clinic at the corner of Samford and Settlement Roads, Keperra. You can find North West Physiotherapy at shop F14B, Great Western Super Centre (beside BCF and Aldi). Due to the gentle nature of these classes, they are primarily aimed at people 55 and above (although not limited to this age group only). We have some younger patients with balance issues caused by neurological conditions or acute injuries who also find that this class is perfect for their needs. We’re very welcoming of all ages and fitness levels! Participants can expect a class that is just challenging enough to result in a light sweat, but relaxed and comfortable enough that they’ll still be able to enjoy a conversation and a few laughs with the other participants. Before joining one of our classes, all participants undertake a strength and balance assessment including using the Sway Balance iPad app. This app records the amount of movement that occurs while standing in different positions to give each patient a ‘Balance Score’. It’s not meant to be scary or negative. This score is simply reassessed after every 6 weeks of participating in the Strength and Balance Classes to help monitor your improvement. You’ll be able to see the positive impact regular exercise is having on your health! 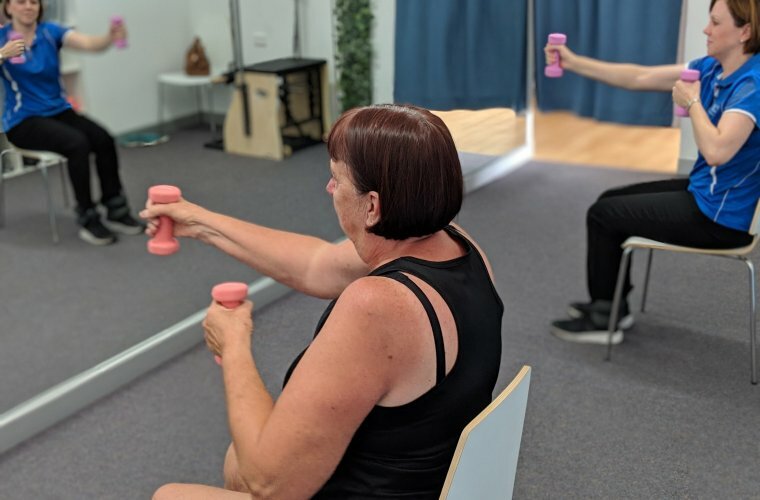 Our classes are designed as a circuit type session with half the exercises concentrating on balance and the other half on upper limb, lower limb and core strength exercises. Each class is one hour long with a maximum of 5 participants per class and run under the watchful eye of one of our friendly, qualified physiotherapists. Here’s just some of the benefits of joining our Seniors Strength and Balance classes! Most attendees currently in our programs participate to decrease their risk of a fall, while also maintaining or improving their current level of activity/function. That’s why we call these our ‘Fine Wine’ classes – because they are designed to help people get better with age.A chair is provided for each participant during the class, so all exercises can be modified to be done either sitting or standing. This means that no baseline level of fitness is required. Classes are currently held Monday 10:30am and 4:15pm and Tuesday 11:15am. To book your place phone us on 3198 4444 or visit our clinic on the corner Samford and Settlement Roads, Keperra.